The development of a high-throughput genotyping platform with high quality, flexibility, and affordable genotyping cost is critical for marker-assisted breeding. In this study, a genotyping by target sequencing (GBTS) platform was developed in maize, which can be realized for a small number of markers (several to 5 K) through multiplex PCR (GenoPlexs) and for a large number of markers (1 to 45 K) through in-solution capture. The later was used for development of four SNP marker panels (GenoBaits Maize) containing 20 K, 10 K, 5 K, and 1 K markers. Two genotype panels, one consisting 96 representative worldwide maize inbred lines and the other containing 387 breeding lines developed in our maize breeding programs, were used to test and validate the developed marker panels. First, a 20 K SNP panel, with markers evenly distributed across maize genome, was developed from a 55 K SNP array with improved genome coverage. From this single marker panel, 20 K, 10 K, 5 K, and 1 K SNP markers can be generated by sequencing the samples at the average sequencing depths of 50×, 20×, 7.5×, and 2.5×, respectively. Highly consistent marker genotypes were obtained between the four marker panels and the 55 K array (over 95%) and between two biological replications (over 98%). Also, highly consistent phylogenetic relationships were generated by using four marker panels and two genotype panels, providing strong evidence for the reliability of SNP markers and GBTS genotyping platform. Cost-benefit analysis indicated that the genotypic selection cost based on the GBTS in maize was lower than phenotypic selection, allowing GBTS an affordable genotyping platform for marker-assisted breeding. 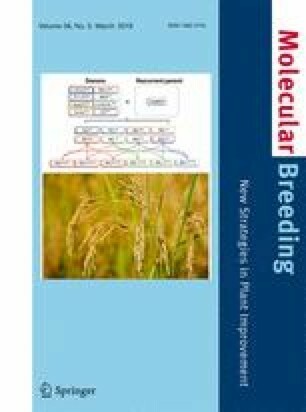 Integration of this affordable genotyping platform with other breeding platforms and open-source breeding network would greatly facilitate the molecular breeding activities in small- and medium-size companies and developing countries. The four marker panels could be used for many fields of marker application, including germplasm evaluation, genetic mapping, marker-assisted selection (including genomic selection), and plant variety protection. Zifeng Guo and Hongwu Wang contributed equally to this work. The online version of this article ( https://doi.org/10.1007/s11032-019-0940-4) contains supplementary material, which is available to authorized users. This research is supported by the National Key Research and Development Program of China (2016YFD0101201 and 2017YFD0101201) and the Agricultural Science and Technology Innovation Program (ASTIP) of Chinese Academy of Agricultural Sciences (CAAS) (CAAS-XTCX2016009), and Research activities of CIMMYT staff were supported by the Bill and Melinda Gates Foundation and the CGIAR Research Program MAIZE.